Fast Facts -- What is the Average Earnings Index (AEI) in Thoroughbred Breeding? The Average Earnings Index (AEI) is simultaneously one of the most popular and oft-quoted statistics in Thoroughbred horse breeding, and one of those numbers that tend to be thrown around without actually being completely understood. Fortunately, it's a fairly straightforward concept. To start, here's how we define AEI in TBH MarketWatch: "The AEI measures the earning power of a sire's progeny by comparing the average earnings of his runners with all other runners of the same age that raced in the same country during a given year." You'll notice that AEI is most often cited in relation to the progeny performance of a stallion, and that is the way it will be discussed here. 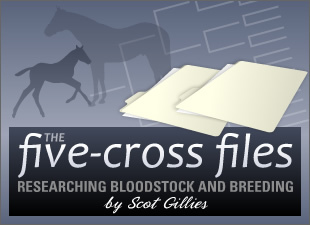 Using AEI in reference to an individual runner or to compare progeny by mare or female family, or by damsire, or by many other criteria, however, are all valid uses of the index. Now, a few words of background. The AEI was developed by Joe Estes while he was editor of The Blood-Horse. He came up with the index to allow comparison of stallions from one generation to the next without resorting to a side-by-side look at earnings in dollars, which naturally don't maintain equal value over time. It should be possible to compare sons of Seattle Slew with sons of Man o'War, who lived generations apart. It should also be possible to compare offspring of two contemporary sons of Sadler's Wells regardless of the size of their foal crop -- Northern Spur (IRE) has 5 juveniles this year, for example, while El Prado (IRE) has 60; it would be misleading to compare their progeny earnings in pure dollars. Basically, Estes figured out what was the average paycheck a runner earned in a year and called this figure the "expected" earnings for the average Thoroughbred racehorse, equivalent to 1.00 AEI. If the annual average earnings for Thoroughbreds was $10,000 and a given runner earned $12,500, his AEI would be 1.25 (or 1.25 times the yearly average earnings figure). The average earnings figure could then be indexed by group for additional comparisons. It is possible to calculate, for example, the AEI of a sire or damsire based on all of his progeny -- or to determine the AEI of a more specific group (freshman sires are one example). The Average Earnings Index has a few flaws -- the primary one being that it is easily skewed by one or two big earners. (I recently discussed an example of this phenomenon in a MarketWatch blog post about the Broodmare Sire AEI of perennial leader Sir Harry Lewis.) Several newer indices attempt to account for this problem by modifying the AEI calculation. I actually prefer the original AEI (as do most breeders, based on the system's near-universal acceptance in the breeding industry) because it tells the full story. Yes, it can be skewed by a big runner -- but it is the big runners throughout history that have helped to make or break a sire, and the ability to come up with an occasional big runner that ultimately factors into a stallion's success at stud. Issues of MarketWatch in late winter and early spring each year include lists of top sires (February 2009) and top damsires (April 2009) by AEI. A good source of additional information about the AEI is The Estes Formula for Breeding Stakes Winners, by Joseph A. Estes. (Trivia: His middle name was Alvie.) "The Estes Formula" is a combination of common sense and well-researched theories that should be part of any pedigree enthusiast's studies.